At its largest, Little Italy used to occupy a space in lower Manhattan bound by Lafayette Street to the west and Bowery to the east, Kenmare to the north and Worth Street to the south. Or was it Kenmare to the north and Canal to the south? Or maybe it stretched all the way down to Chambers and up to Houston, and pushed west to Broadway? The historical borders of Little Italy are disputed. Some argue for a rather large swath of the city and others a relatively small one. It all depends on who you ask. Even now, Little Italy as a space in New York City is hard to define. Its borders have been shrinking for decades as rising rents have forced residents and local businesses alike out of the neighborhood. Frank Lava’s gunsmith shop, now No.6 Store, a boutique vintage clothing shop. Take Centre Market Place, for instance. 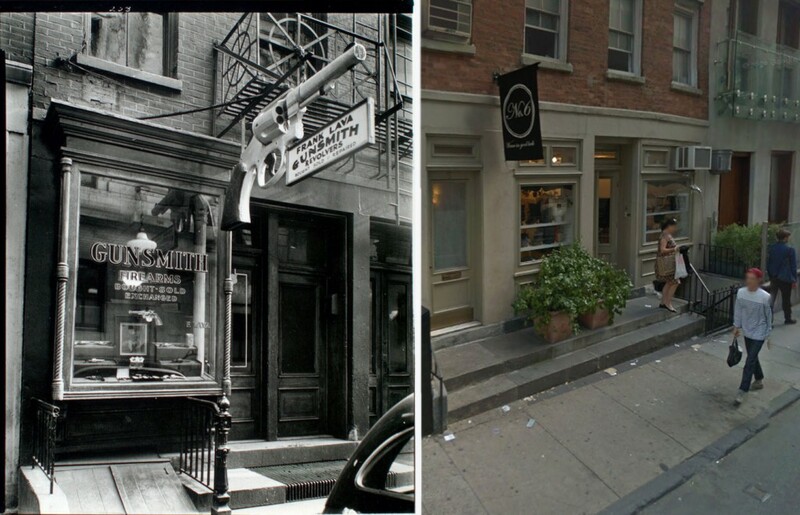 Stretching just one block from Broome to Grand, it used to be the city’s de facto gun district, and was home to several gun stores (pictured above is Frank Lava’s gunsmith shop, circa 1935) as well as the NYPD headquarters. It was also home to Weegee, an infamous crime photographer who lived on the block (next to Frank Lava’s) in the 1930s and 40s and documented the morning perp walks. These days, a two bedroom in Weegee’s building goes for $4,600 a month, and downstairs is a bridal shop. Next door, Frank Lava’s gun shop is now a boutique vintage clothing store — a blouse there will run you about 300 bucks. If you’re in the market for a whole building, you could snag the gut renovated townhouse on the other side of Frank’s for just north of $10 million. Pretty far from Little Italy’s far more inauspicious start. Below, we’ve compiled a brief glimpse into the neighborhood’s past through archival photos and prints. Little Italy initially began to take shape when the first wave of Italian immigrants arrived in the 1840s in the neighborhood of Five Points. 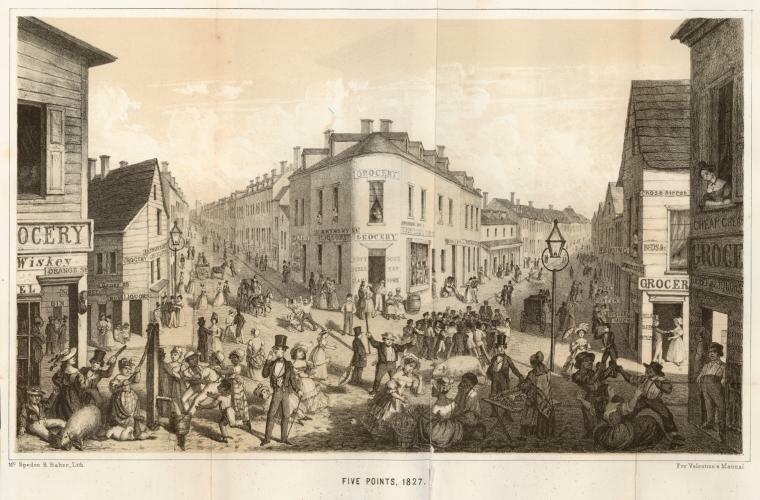 Five Points was an overpopulated, disease- and crime-ridden area notorious for its tenement buildings and lawlessness. By then, middle and upper class residents had fled the area, leaving only the poor, mostly immigrants, to suffer its squalor. The biggest wave of Italian immigration began in the 1880s. Like the influx of Irish immigrants escaping the potato famine in the 1840s, the masses of Italians arriving in America were fleeing hardships at home. And the numbers were big: between 1880 and 1920, over four million Italians arrived in America, with tens of thousands settling in New York City alone. 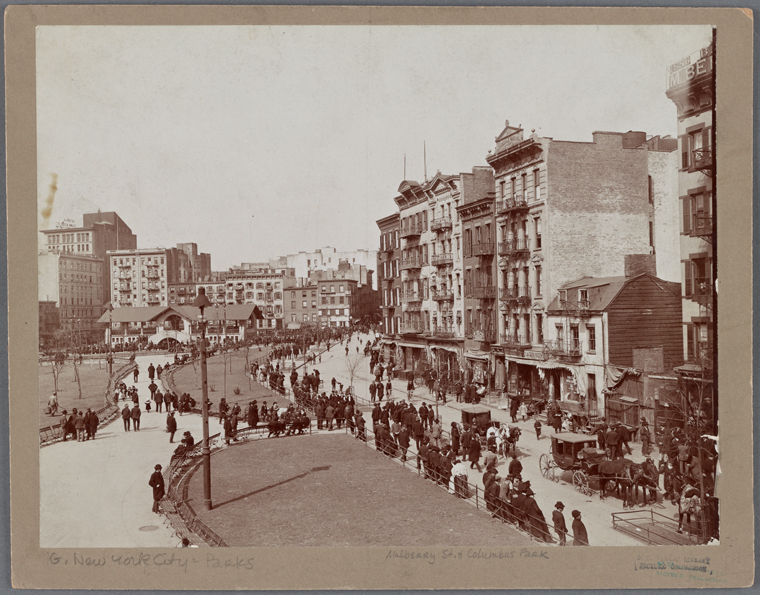 Many settled into an area of Five Points called “Mulberry Bend.” This was one of the worst areas of Five Points, which itself was one of the worst areas in Manhattan. It was so bad, in fact, that in 1897 the city razed a number of tenement buildings and built Mulberry Bend Park in its place (now called Columbus Park). Columbus Park, also known as Mulberry Bend Park. Photo is from 1899 after Paradise Square was razed. It was also right around this time that Little Italy reached its peak population. 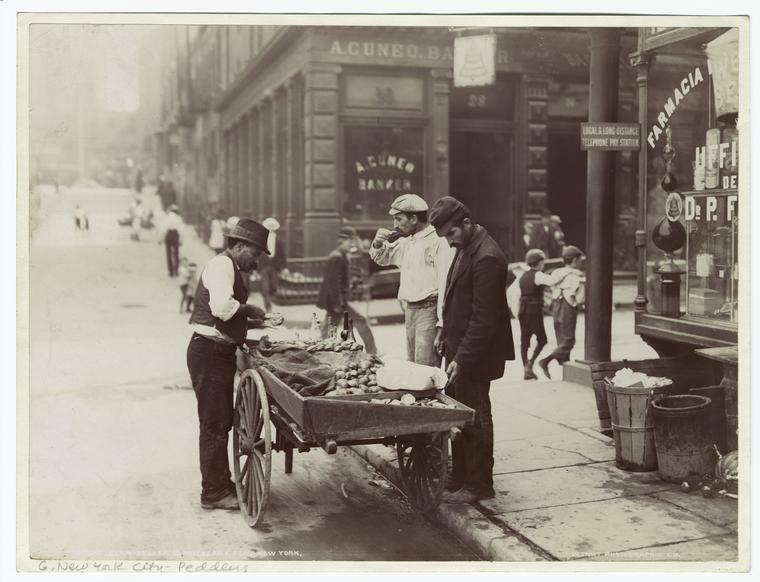 Almost 10,000 Italian-Americans lived in a roughly two square mile area. Many who moved to the city moved to other Italian enclaves: the “other” Little Italy in the Bronx; Bensonhurst and Bay Ridge in Brooklyn; Staten Island. Clam Sellers near Mulberry Bend Park, circa 1900. Signage written in Italian can be seen in foreground right. And as the cost of living in Manhattan continued to increase, the exodus to the outer boroughs was repeated. By the 2010 census, not a single person born in Italy lived in Little Italy. Over time, Chinatown has crept in, annexing bits and pieces of Little Italy as it expands. This co-mingling of real estate became so blurred that even in being declared an historic district by the National Park Service, Little Italy had to share the honor with Chinatown. Now, what remains is about three blocks on Mulberry Street. Never has the neighborhood’s name been so apt.